This has probably been made before, but I haven't stumbled on one myself. This is the Medium Space Invader (also known as the Crab), and probably the most iconic of the enemies from the 1978 arcade game Space Invaders, with artwork to fit the FTL artwork. 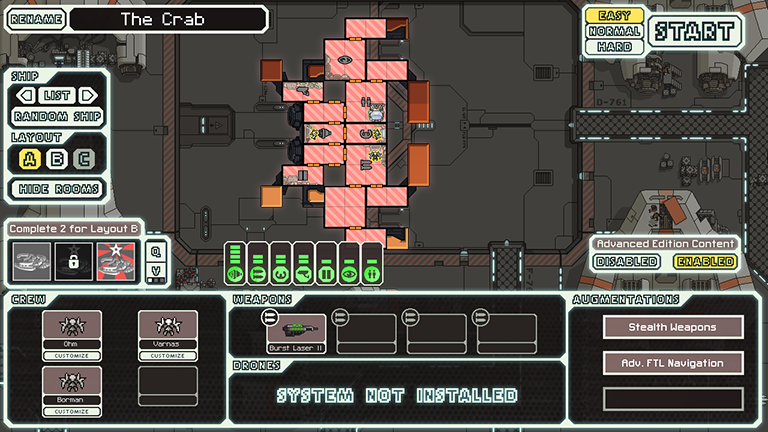 This ship can be both challenging in sectors 1 through 7, or become rather easy dependent on your luck, what the real task becomes is to make it harder for yourself in those sectors to get the tools for the final battle as I've yet to beat that or see it beaten by people who tested it for me. This ship should only be played with Advanced Edition content on. 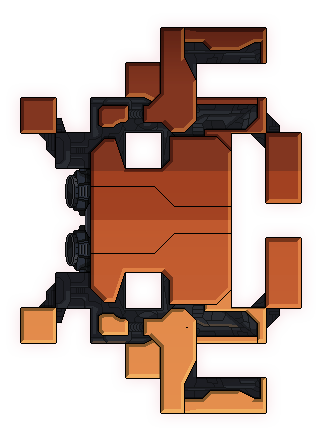 It relies on cloaking instead of shields entirely, as shields are not supported. Though this modifies the cloaking system to be at a maximum of 6 power rather than 3. which I thought would make the ship easier to play. It's not completely balanced, but this seems to be the closest I can get. It resembles the Stealth Cruiser Type C a bit, but it hopefully it differs enough. Dang, it actually really does fit the FTL style! Nice! I have to ask, though--have you tested level 6 cloaking? Does it work? Or does it kinda just crap out at 3 bars of cloaking, and all bars afterwards don't do anything? NarnKar wrote: Dang, it actually really does fit the FTL style! Nice! Thanks man. Yeah I got that tested, for each level you get 5 more seconds cloaked, which means for 6 bars, that is 30 seconds cloaking, which would be overpowered for nearly anything else, but at 14 hull and no shields it helps with those harder scenarios where you need to disable their offensive line before you die. It's come to my attention that this ship didn't work for one of my friends, and thus I would like to know if anybody else experiences this scenario. I can run it fine myself and fail to see where I should have made a typo in my scripts. Sounds like user error to me, but then again, some people just have cranky computers. I did take a look and noticed custom engines and weapons that don't have functioning glows. You need a file called rooms.xml.append to make them work. I'll even give you the code (that I believe should work based on the images in the mod file) to put in the file. RAD-82 wrote: I did take a look and noticed custom engines and weapons that don't have functioning glows. You need a file called rooms.xml.append to make them work. Whoops, thanks man, and now when I think of it, I think I'm missing room.xml.append from the Firefly mods as well, I just never noticed when running them.